Last weekend saw the third edition of the popular Vibram Hong Kong 100 take place along the picturesque Maclehose trail. Weather conditions were perfect and over 1,200 keen participants from 30 countries had signed up for the fun. Once again RDs Janet Ng and Steve Brammar had put on a fantastic event. Especially the support by the volunteer scout groups at different checkpoints gave the race a very unique, enjoyable character. 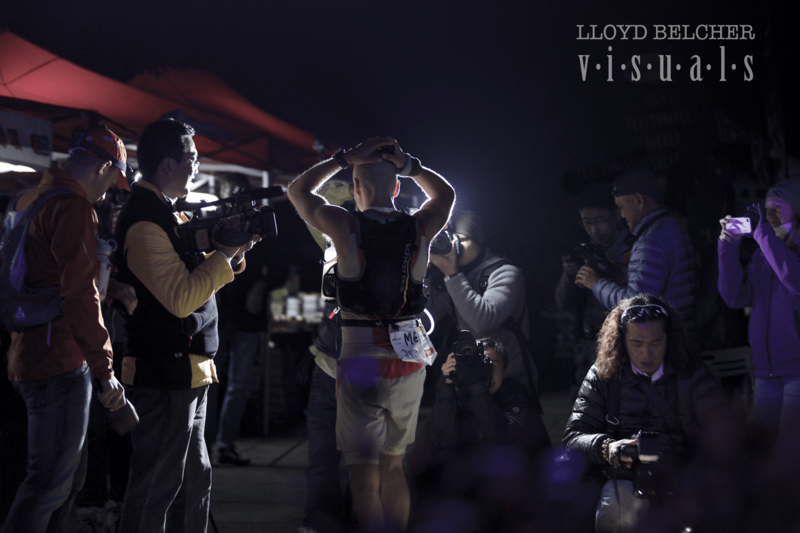 Lloyd Belcher and Andre Blumberg followed the action at the front of the race closely during the day, and into the night, and bring you Andre’s race report and some of Lloyd’s stunning photos (check out his site here for many more). Let’s start with the women’s field. With Kami Semick and last year’s winner Nora Senn out of play due to injury related reasons, and Claire Price undecided whether to join with some hamstring niggles, the pre-race expectations initially centred around four women. Olya Korzh from Hong Kong had finished 4th the year before and was in the best shape of her life (see our pre-race interview). Experienced Chiaki Fjelddahl, a Japanese based in Hong Kong, had just finished the Oxfam Trailwalker in a mixed team as the fast female of the entire event and joining from Nepal was a promising Mani Kala Rai, out for her first race on international soil (also with a pre-race interview). Heading down south from China for the second year was experienced Xing Ruling (again with pre-race thoughts). Glad to hear that Claire decided to join after all during the week leading up to the race, it was hard to predict how things would pan out. Not to mention there were some 200+ further female participants whom we didn’t have on our immediate radar for the podium. Claire Price and Xing Ruling traded places in the lead during the first 25k with Claire faster on the downhills and Ruling stronger on the uphills, and Nepalese Mani Kala Rai being in the mix during the early stages of the race as well. Both Chiaki Fjelddahl and Olya Korzh appeared to take it a little more casually during the first half but then closed in later on. In the second part of the race Claire decided that she was feeling good and ready to push it a bit harder, so she never gave up the lead and in fact extended it with every stage. Behind her however the battle for second and third place unfolded. Chiaki, with over 15 years of trail running experience under her belt, kept up the pressure and eventually overtook everyone except the race leader. Claire Price finished first and smashed the course record established by famous Lizzy Hawker back in 2011 by 20 mins in the process, shaved off 42 mins of her previous year’s time and went sub-12 in an amazing 11:58 hrs and 13th place overall. 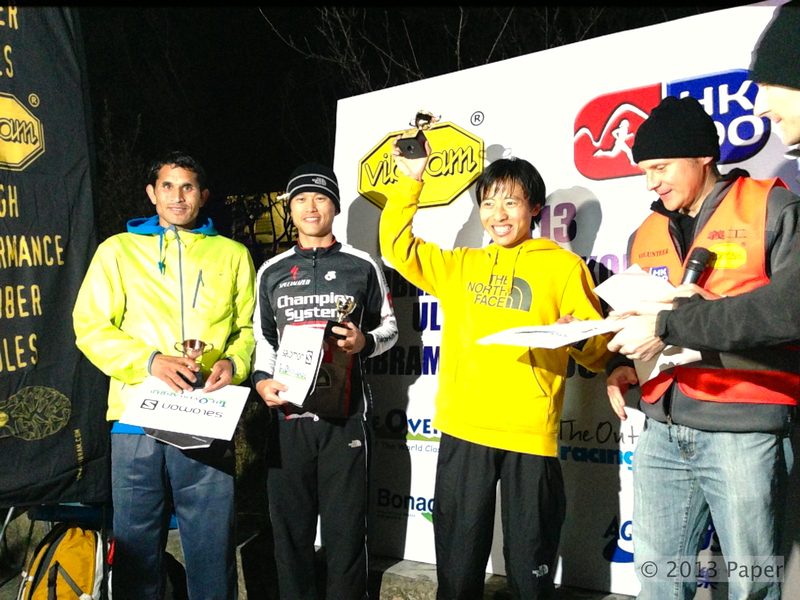 Chiaki Fjeddahl came second in 13:04 hrs and Olya Korzh rounded up the podium in 13:10 hrs. Well done, ladies! Over to the men’s side, this year was different from last: No Ryan Sandes or similar global superstar. Vibram flew in two of their top Euro runners, Nicola Bassi from Italy and Sebastien Nain from France (pre-race interview), both with credible achievements. Andrew Tuckey was on a Hong Kong stopover from Sydney enroute to Europe and joined the action (pre-race thoughts). But that was pretty much it as far as we could dig out based on the list of participants. No, this year was really the year that the Asian ultra runners would strike. With registrations numbers up 55% over last year, it was clear that we couldn’t possible know everyone with Top 10 pedigree in advance. Going into the race week, it was fairly obvious that Team Columbia from Nepal came for one reason, and one reason only: to fill the podium. And they didn’t hesitate to tell anyone willing to listen (as you can see here) that Aite Tamang was to take the top honours, followed by Ram Kumar Katri in runner-up position. Case closed. Well, not so quick. China sent a huge number of participants, including perhaps the most prolific ultra runner from the Mainland, Yun YanQiao, who was returning for a second serving after finishing fifth place in the prior year. But the China ultra scene is growing quickly, as YanQiao pointed out in our pre-race interview, so we weren’t sure whom else to expect. But we were quite sure who would be up at the front coming from Hong Kong: Jeremy Ritcey, Stone Tsang, William Davies and about a dozen other fast guys from or based in the HK SAR. From the Philippines, another rapidly growing ultra land, two athletes of Team Bald Runner (interview here), Gerald Sabal and Marcelo Bautista joined, both for their first ultra internationally. Andrew Tuckey ran a very smart and steady race and finished strong without any support crew. The men’s race started fast, and remained fast for the first 80k. The Nepalese duo of Aite and Ram Kumar put on a furious pace that was at just 11k into the race already 5 mins under the course record and this would grow further later on. Ram Kumar took the lead in what appeared to be the Nepalese race tactic to conserve Aite for a subsequent attack for the win. All of the main contenders remained in fairly close distance but Nepal was directing the play. Nepal 1-2 into SP1. Nepal 1-2 into CP1. Nepal 1-2 into CP2. You get the drift. At CP3 (36km) the duo was 9 mins below the course record with YanQiao in pursuit some 5 mins behind, followed by Stone, Gerald, Andrew and Jeremy. Then coming out of CP4 (45km) during a short uphill road section, we could witness something unusual, the Nepalese were walking. Seemed a bit strange at the time but perhaps they just wanted to digest the aid station food a bit. YanQiao ran the section, being the usual happy and smiling self, 5 mins down. Then came Stone, also walking with sandwiches in hand, then a running and determined as ever Andrew, then Gerald and Jeremy. Seven short kilometres but a nasty hill or two later coming into CP5, the powers started to slowly but surely turn. Whilst Aite was still in front and 8 mins ahead of course record, Ram Kumar and YanQiao arrived together just 3 mins later. What was happening to the Nepal strategy for both to run together and support each other? Was Ram Kumar slowing down or was YanQiao stepping up the game? Stone came in after a lengthy 19 mins, Andrew another 7 mins. Then 9 mins after that a new face appeared on the surface of the 2013 HK100 – Jonathan Garnett, a Canadian living in Hong Kong was in 6th place. Where did he come from all of a sudden? He was followed by Gerald, Jeremy and Nicola Bassi in short succession. Now it started to get interesting. The race was on from CP5. Unfortunately CP6 and CP7 are not easily accessible by transport, so after watching the lead women come into CP5 we moved to a section of trail before the Tai Po Road crossing between CP7 and CP8 at about the 76km mark. Ryan Sandes passed this section in his course record time at about 15:34pm. We arrived around 15:20pm given the previous section times were faster. The first runner appeared through the bushes on downhill slopes. Ah, that should be Aite then. Wrong – YanQiao showed up: smiling, happy, running light and smooth just like he had only started the race. OK, so Aite would be coming soon, right? Wrong again – nobody came for another 13 mins. Then a rather distraught Ram Kumar showed up, asking how much the leader was ahead, only to proceed in a mad chase. He was clearly not running his own race, but it appeared he wanted to salvage whatever misery Aite was in and pull back YanQiao. Alright, so Aite would then come in third, right? Nope, again wrong – Stone showed up 5 mins later, feeling great and running at a decent clip down the descending switchbacks. Finally Aite arrived, a whole 22 mins down on the leading Chinese, complaining about muscle cramps and in a slow jog compared to those ahead as well as those behind. Andrew arrived another long 12 mins afterwards in 5th but was moving great and in good spirits, followed by Jonathan Garnett after another 18 mins and in hot pursuit by Jeremy Ritcey who seemed to have finally found his form, but still down in 7th position. The next few runners were Nicola Bassi, Thomas Lam Shing Yip, William Davies, Law Chor Kin and Peter Lee. We now headed off to the finish line to make sure to be there in time for the arrival of the winner. With 24 km to go and no access to CP8 and 9, the suspense was nearly killing us. Would YanQiao continue his lead? Would Ram Kumar, or even Aite, manage to catch him? Or would perhaps Andrew pick up the carnage and end up further up in the rankings? The 10 hours mark came and went and no runner in sight, so Ryan Sandes’ course record was save. Finally headlights appeared – it was Yun YanQiao who ran a super smart strategy to finish first in a speedy 10:16 hrs, the second fastest time ever. The drama for runner-up couldn’t have been more exciting: Stone and Ram Kumar approached the finish neck to neck with local Stone Tsang having the upper hand end finishing in 2nd place just 16 seconds ahead of Ram Kumar Katri. A good 24 mins later Andrew Tuckey came in as 4th and Jeremy Ritcey had obviously made up plenty of ground in the last quarter of the course, finishing in 5th place. A clear race favourite pre-race, Aite Tamang eventually arrived in 6th, almost an hour later than his 2012 runner-up result. Winner YanQiao was over the moon and all smiles and happiness. Whilst having achieved success in many races, this was really the first big international race win for him apart from TNF100 Singapore four years ago and with a tiny field. Not to be outdone, Stone Tsang was very emotional as well after his finish, the sprint across the line after a long day in the office clearly not just a physical but also a big mental challenge. 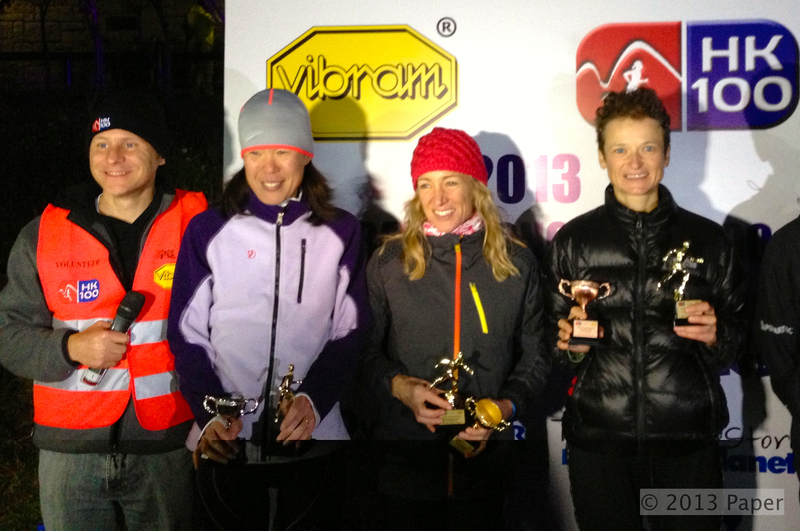 So what do we make of the 2013 Vibram Hong Kong 100 results? We think several observations are in order. 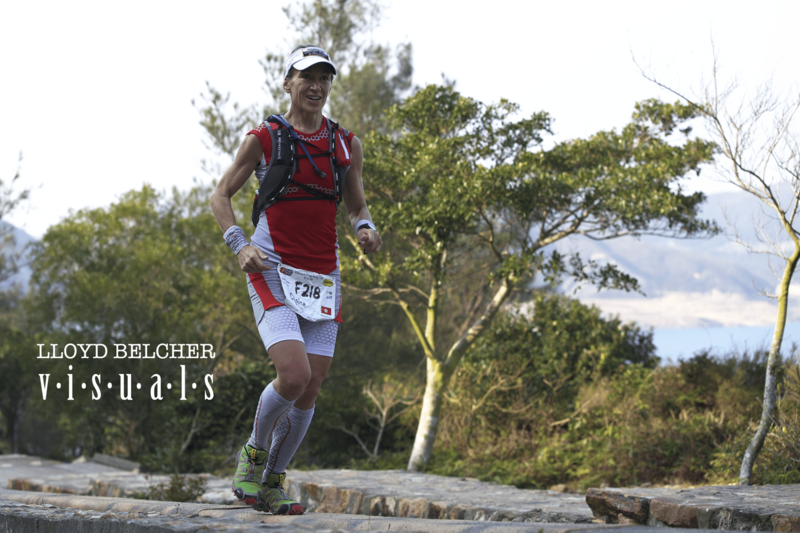 Firstly, ultra trail running is as popular in Asia as it is everywhere else in the world. Secondly, times are coming down and the top end of the field is getting faster, much faster in fact. In 2011, only two finished sub-12, in 2012 ten managed to do so, and this year thirteen people, including Claire Price and eight Hong Kong residents achieved the feat. Six of those thirteen are native Chinese, Nepalese or from Hong Kong. 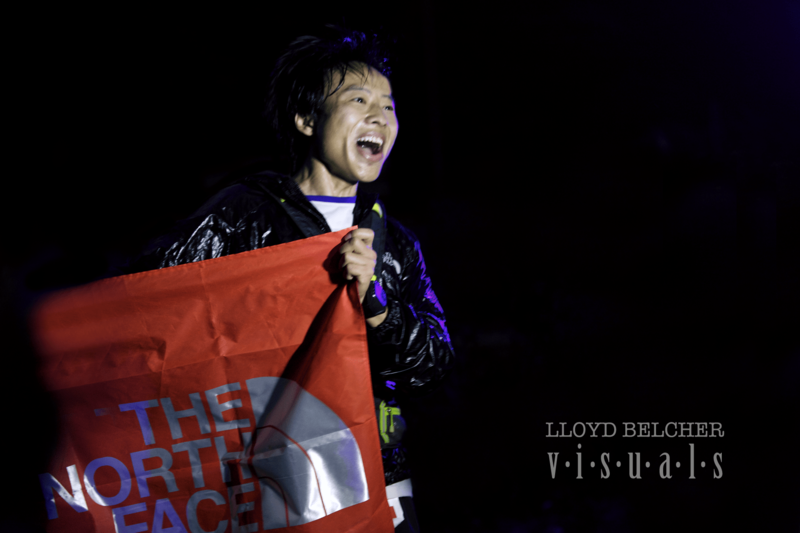 We feel this is a cornerstone in the rise of Asia, and in particular Greater China, in the ultra trail world. Last but not least the race can be summarized by some fine words of wisdom. It’s not how you start that matters. It’s how you finish. True in life, true in ultras, and certainly true for the 2013 Vibram Hong Kong 100. Brilliant race report perfectly capturing the drama and suspense of the day!!! Why post the top 10 men and only the top 3 women!!!??? teeheehee thank you Mr Blumberg! Pingback: 100 kilometres is a long way without a smile | Run Rae, Run!